On the east bank of the river Hunagpu, during the last 20 years a new financial center of the world named Pudong (浦东新区; Pǔdōng Xīnqū) has emerged. All relevant international companies open their representative offices here, a number of skyscrapers under construction is amazing, and the lights at night are unbelievable and breathtaking. 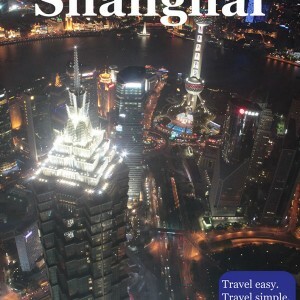 It is the busiest part of Shanghai, and it became a dominant place for new technologies, trade, finance, shopping and working. Walking through the Pudong area is actually walking through the forest of skyscrapers. Suggested walking tour is about 2.5 kilometers (1.55mi) long and consists more of admiration of the grandiose structures from the outside, rather than seeing them from the inside. The exception is the Shanghai World Financial Center, where it is recommend to climb to one of the highest observation desks in the world. If you do this walking tour during night, when the sparks of thousands of lights and reflectors appear, you will feel like you are floating through the wonder galaxy full of stars of different colors. However, even during the day, this walking tour is interesting. If you do it during the day, make sure to go at least to the Shanghai Financial Center observation desk when it gets dark, because then the view is definitely the most beautiful. Overall, walking tour should last about 1.5 hours of walking. The proposed walking tour should be seen more as a general guideline, and you definitely should go where the lights and feelings take you. The walking tour starts with the Bank of China Tower (上海中银大厦; Lujiazui metro station, Exit 5). This building is on the list of the tallest skyscrapers in the world, with the height of around 226m (742ft), which makes 57 floors. The floor area covers around 124,444m² (1,339,504ft²). In southeast direction it offers a beautiful view, where magnificent Jin Mao Tower, Shanghai World Financial Center, and Shanghai Tower proudly stand. Just cross the Lujiazui East Road you will see Shanghai International Financial Center (上海國際金融中心). This two building complex of a very appealing architectural design was completed in 2010 and it combines places where people can live, work, shop or simply enjoy their free time. It covers an area of 400,000m² (4,305,564ft²) and it is 259.9 meters (852.7ft) tall. From Bank of China head north-west along Lujiazui East Road (陆家嘴东路) toward Oriental Pearl TV Tower (东方明珠塔; Dōngfāng Míngzhūtǎ). TV tower is 468 meters (1,535ft) high, and until 2007 it was the tallest building in China. The tower consists of 11 spheres, where you can find an observatory, restaurant, hotel space with twenty rooms and exhibition space. When you climb to the lookout of the tower, the only thing you can see are numerous cranes and skyscrapers, and the city that never sleeps. From Oriental Pearl TV Tower walk along Lujiazui West Road (陆家嘴西路), all the way to the waterfront and Binjiang Park (滨江公园). 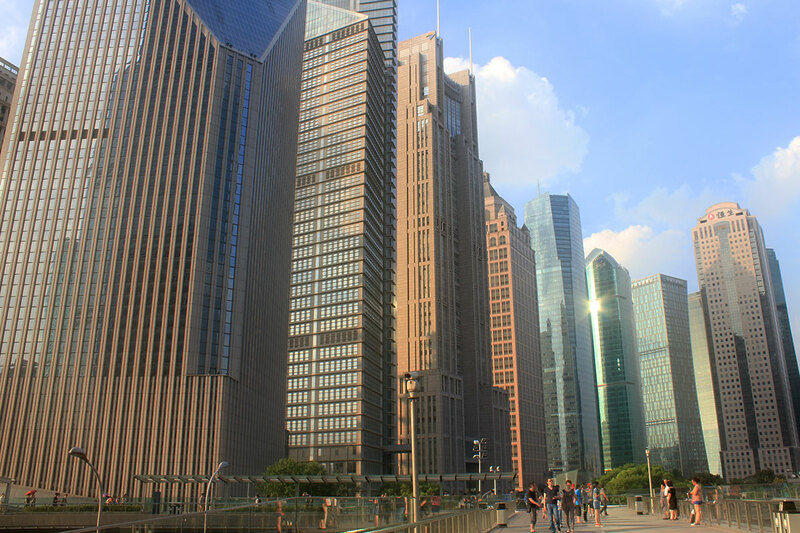 You may walk along the waterfront and enjoy the view of the Bund and the Huangpu River. There are also Pudong buildings that stand opposed to those on the Bund and with which they compete in beauty, like the Pudong Shangri-La Hotel. Huayuanshiqiao road (花园石桥路) will take you from the Pudong waterfront to the Shanghai Tower, Jin Mao Tower, and Shanghai World Financial Center (SWFC). Shanghai Tower (上海中心大厦; Shànghǎi Zhōngxīin Dàshà), finally finished this year after 7 years of construction, proudly holds the position of the tallest skyscraper in China and the second largest building in the world (the first is a 828 meters Burj Khalifa, Dubai). It is 632 meters (2,073ft) high, and it has 128 stories. It covers an area of 380,000m² (4,090,000ft²). Jin Mao Tower (金茂大厦; Jīnmào Dàshà), being 421 meters tall, houses corporate offices, restaurants and the Shanghai Grand Hyatt hotel. Observatory deck is located on the 88th floor, although the building has over 93 floors, but floors after 88th are closed to the public, since these areas are reserved for technical rooms. It’s hard to imagine better way to finish Pudong walking tour than admiring this city from spectacular observation desk in the Shanghai World Financial Center.